Raspberries bloom from spring to late summer, as berries form continually on the thorny brambles. Indian names are Oo na joo kwa (Mohawk), Miskominaga wunj (Ojibwe). Rubus strigosus.and Rubus ideaus are botannical names. 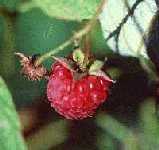 Strigosus is the original native wild raspberry. Rubus ideaus is another common wild species found in meadows. Rubus occidentalis, a wild black raspberry, is usually called blackberry. Raspberry leaf teas have long been known as a medicine for pregnant women. The leaf tea is also suposed to increase fertility for couples having difficulty conceiving. A danger for teas of all these berry leaves is that when the leaf is wilted but not fully dried, a poison temporarily develops (livestock can get sick eating wilted leaves, too). 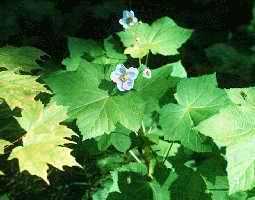 Pick leaves when the plants are flowering and either use at once, fresh, for teas, or dry them fully for 2 weeks in shade. Use 1 - 2 teaspoons of crushed dried leaf, or 1 tablespoon of bruised fresh leaf per cup of boiling water (steep for 15 minutes, drink cool or srain and reheat). Dilute raspberry leaf tea 50% if using to treat infant diarrhea. The tea is slightly rose-scented, but astringent, because of tannins in the leaf. Native women's use of raspberry teas as an aid to pregnant women was first confirmed by a medical study that appeared in 1941 in the prestigious British medical journal Lancet. A complex biochemical thar relaxes the uterus has been found. Raspberry preparations have a history in Europe as well as the U.S. in treating for morning sickness, uterine irritability, threatened miscarriage, and as a birth assistant. In western medicine, it's been widely recommended as a uterine relaxant for over half a century, with no reports in the medical literature of bad effects. Recent studies also show it tends to reduce blood sugar (glucose) and may be helpful to diabetics. AGIS phytochemical analysis for raspberry fruit, leaf, and whole plant. Does not record high vitamin C content of the berry (but does for leaves). Does not record the well-known uterine relaxant. Clicking on a chemical brings a list of alleged biological effects of the chemical (if kinown), followed by a list of other plants (in alphabetical order) containing some amount of that chemical. Tribal Medical Uses of Raspberry from AGIS MPNADB Medical Plants database -- a list of ethnobotanical literature sources. Cliucking on the use gets you the citation. Clicking on the plant brings up a list of other plants used by that tribe. CREDITS: The photos are from the University of Wisconsin (Madison) botany gopher, taken by Dr. Virginia Kline, of the Wisconsin Arboretum (Madison). Webmistress --Paula Giese.Text and graphics copyright 1996.